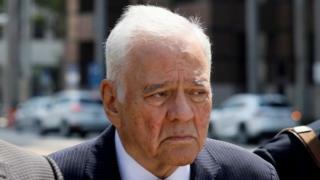 A jury in the United States has found Bolivian ex-President Gonzalo Sánchez de Lozada responsible for the deaths of dozens of protesters in 2003. His then Defence Minister, Carlos Sánchez, was also found responsible in the civil lawsuit. Their lawyers said they would appeal against the decision. The plaintiffs accused the two men of ordering the Bolivian military to use force to break up the 2003 protests. The victims' families were awarded $10m (£7m) in damages. The families welcomed the decision saying it gave them "great satisfaction". They also expressed the hope that it would not be overturned on appeal. The lawsuit was brought by eight families whose loved ones died during protests against plans to export natural gas from Bolivia to the US. At least 67 people were killed and more than 400 people were injured when soldiers opened fire during the protests in the city of El Alto, near La Paz. Five former top military officers and two former ministers were sentenced to jail over what is known as the "October massacre" in 2011. Bolivia has long been seeking the extradition of Mr Sánchez de Lozada and Mr Sánchez, who moved to the US shortly after the violent suppression of the protests. The protests against his free-market policies, including the planned export of Bolivian natural gas, prompted Mr Sánchez de Lozada's resignation only one year into his five-year term. His successor in office, Carlos Mesa, called a referendum on how best to exploit the country's huge natural gas reserves in order to defuse the protests. An overwhelming majority voted in favour of the state regaining control over the gas sector, which had been opened up to private investors, and against exporting natural gas.